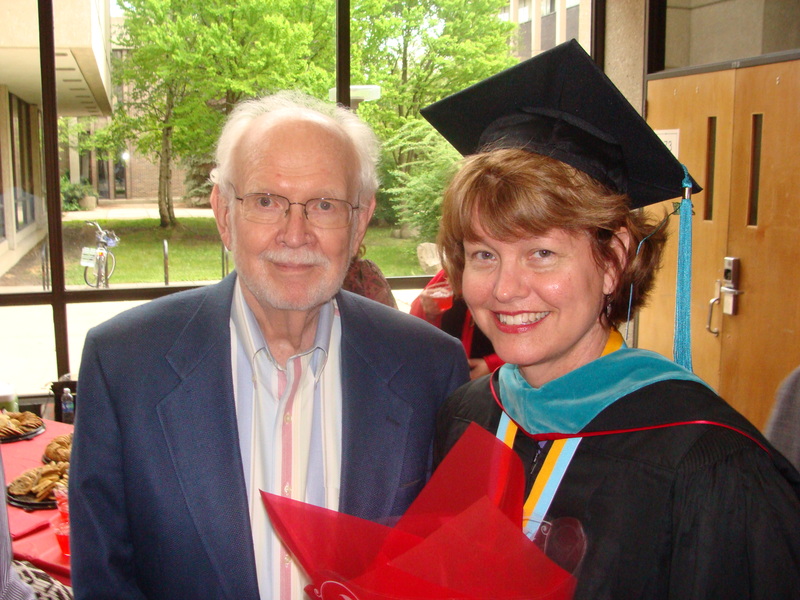 PHOTO NOTE: This photo was taken with my dad after I graduated from Northern Illinois University (Masters in Public Administration in May, 2011). INTRO: Some things you don’t learn in the classroom, but only by going through it firsthand. I took my frustrated energies and created a list of helpful hints that will hopefully make your recovery just a bit easier. 1. Rest. Take it totally easy the first full week. Take multiple naps, watch movies and relax. Have people do almost everything for you to avoid overdoing it. 2. Drains hurt! There is no way around this. They are sewn into your body to stay in place. Their job is to keep body fluid flowing out of the area operated on to avoid swelling – they are doing their job, so remember that when you are cursing them and their pinching and discomfort. A small pillow placed in between your side and armpit can help reduce the friction and pain. Also a pillow purse can also help avoid the bumping. Warning…drains can be painful when you empty them. Once you empty them the suction is better and pressure increases. If this pain catches you off guard, you can unplug the drain to temporarily ease the pressure until you can get situated better. Plan to take your pain meds one full hour prior to emptying your drains to minimize your pain. NOTE: Take a FULL dose of pain meds one hour prior to your appointment to get your drains out. This can be a very painful procedure so plan ahead (and bring in a friendly hand to squeeze). The surgeon first snips the stitches, then pulls out the tube with a firm yank. No butts about it – it will hurt, but having no drains is SO much better. 3. Pain Medication. Don’t be afraid to take this regularly. When you are in pain (past a 4 of 10) it is too late. It seems counterintuitive to take pain meds when you are not in a lot of pain, but the job of medicine is to avoid pain (and relieve pain as well). Managing pain early on avoids feeling miserable waiting for pain meds to kick in. If one pain med isn’t working for you or making you have bad side effects, call your doctor and get a different one. You should not have to be in horrible pain, so don’t be a martyr. Keep a regimented schedule for the first week, then reassess after your drains come out. 4. Doctor visits/car trips. Plan your pain meds accordingly before you go see the doctor. You’ll be moving around in ways you haven’t been at home, so, again, plan ahead to avoid a painful trip. Bring a pillow with you to put between you and the seat belt too. 5. Sleeping. take your full dose of pain meds one hour prior to bed and sleep in the guest room if you have one. Spread out and put a pillow under your affected side/s. Simply elevating affected arm/s takes off the pressure. 6. Physical Therapy (PT). If your surgeon or the hospital doesn’t give you exercises to do at home to help your recovery and range of motion (ROM), ask for a PT prescription! A PT will help you regain ROM and massage your scar tissue, adhesions and also give you encouragement. Some PT’s are also certified in lymphedema, a painful condition of arm swelling that can happen when lymph nodes are removed. Put a PT on your care team and help yourself heal faster. You might also try ASTYM treatment that helps regenerate the affected areas more quickly, but check with your doctor first. Here is a link to get you moving http://breastcancer.about.com/od/lifeaftertreatment/ss/arm_exercises_tutorial.htm. 7. Fatigue. This is normal, but very frustrating. Ease into your ‘normal’ routine. Your body is recovering from a major ordeal and healing takes a lot of your cellular energy. Work in ‘spurts’ – maybe three a day – one in the morning, one in the afternoon and one in the evening. A spurt may only last 15 minutes or up to an hour or two depending on where you are in your recovery. Plan a small little chore to do for your next spurt (not shoveling the snow off the driveway) so you have something to look forward to and feel a small sense of accomplishment. Work on a scrapbook, organize your photos, empty the dishwasher, and arrange flowers, whatever you feel like doing, just don’t over do it. 8. To Cammy or Not? If you did not have reconstructive surgery, you may want to purchase a camisole. Most insurance covers this and you can be fitted for a prosthetic to slip in the cami. Some camisoles are designed to hold your drains – that would be better than the constant pinning and unpinning of the drains! You should wait until your drains are out to be fitted for a prosthetic insert. Specialty boutiques take appointments; ask to make sure their staff are certified fitters to make sure you get a proper fit from caring and knowledgeable professionals. Also, the American Cancer Society has resources at no cost if this is an issue. 9. Resume Exercise. The sooner you can get up and about, the faster you will heal. Everyone is encouraged to walk. Start by walking the halls of the hospital – one lap on day one, two laps on day two, or whatever you feel up to. This is not a race, so listen to your body and stop when you are tired or dizzy and rest when you are tired. When you get home from the hospital, walk to the end of the block, then a bit further each time. Take someone with you if you feel unsteady and don’t walk outside if weather is icy or unsafe. You don’t want to create more problems by falling! Take your cell phone with you as a precaution so you can make a phone call if you need to get help. 10. Reach Out. You are undergoing something that is not natural. Losing a breast or breasts is very a major deal both physically and emotionally. Cry when you need to and laugh when you can. Do not crawl up into a ball and feel sorry for yourself (easier said than done). There are other women that have gone through what you are feeling. The American Cancer Society has the “Reach to Recovery” program that can match you up with a volunteer who has experienced much of what you are going through. Also, Immerman Angels can pair you with someone whose breast cancer experience is similar. I participated in Living Well Cancer Resource’s “Mastectomy Support Group” and was able to share confidentially with other women who have walked in my shoes. Don’t suffer in silence! Talking is therapeutic and helps heal your inner feminine self. Also check online resources to help answer questions and know you are not in this alone. Check the links section of this website for mentioned resources and others you may find helpful. Thank you for making all this information available! The before and after has been very helpful and empowering! I’ll be sure to share this blog with others! It is my therapy and pleasure to share information and journey. This is MyStory and I hope it helps make YourStory easier. I am sure she will be fine, and I will be thinking of her today. Sometimes the cneacr road with all the hick-ups make you a stronger and wiser person and you enjoy life on a different level once your through it. My mother just had her second mastectomy. I was looking for some post mastectomy clothing and somehow got on your post about the 10 things to expect …I saw the pictue of you and your dad and recognized him. when I noticed your maiden name was Wilk, I had to write. I go to church with your parents! What a great coincidence. I know they have have had a rough year. Just wanted you to know how much I think of them and what they mean to St. James. Thanks for the advice, I will let my mother read this. This comment was emailed to me by Sue and is a great one! been 1 year tomorrow since I had my mastectomy for DCIS. Thanks for the info… surgery is friday and no one is talking about post op!!! 12 days post op…. bilateral mastectomy with TE reconstruction. 18 lymph nodes removed. Still have 1 of 5 pesky drains left. My advice is beg, borrow or buy a comfy recliner to sleep in at night. It’s been a lifesaver for me so far, and will probably need again once permanent implants are put in later this year. Thank you so much for posting so much great information. I have been waiting for my surgery date for over a month. Now that it is less than a week away I am getting incredibly nervous. I have been trying to make sure that I have everything but after reading your tips my mother and I had a race to get ready and go shopping. All the little things take the edge off. Thank you for taking the time to share this information and your tips with everyone to make our journey a little easier! I hope all goes well for you with your surgery. Take a deep breath, let others help as much as possible, and give yourself plenty of time to recover. I just got home last night. I only had to have one lymph node removed and it was fine! I am doing very well & was up & moving a few hours after surgery. I definitely appreciate your tips and remembered in the hospital about the pain medicine! It is true. Stay on schedule with the meds and ask before it starts to really hurt. Remember, nurses have to place the order it and wait for it to process so you won’t get your meds right away! I learned that a few hours after surgery. Also, try to keep track of what meds and dosages they are giving you. Also, I would recommend that you clean off and sanitize your entire bathroom counter and make site you have paper towels to dry your hands! (Those disposable hand towels that are in a box like facial tissues work perfect!) I didn’t realize all of the stuff I was going to need to drain the bulbs, dressings, etc. and didn’t have the counter space ready. Just a thought. Thank you so much for creating such a helpful page. It is scary and you don’t know what to really read and believe! Your info was straight on! So happy everything went well and they only took out one lymph node. That really reduces your chance of lymphoma, though it wouldn’t hurt to read my white paper on lymphoma on the resources page. Rest up, let people help you out and take time to catch up on reading and count your blessings. I like your additions to the list and should figure out a way to update my top 10 to be Top 20 to include all the great tips folks send me. Britta Wilk McKenna Founder, Breast Cancer MyStory, Inc.
Hi, I’m 6 days post surgery; partial radical mastectomy of my right breast, level 2 dissection of lymph nodes. There were 12 within the tissue taken, 3 were infected. My Dr says that’s good news, 4 and above the odds of it metastasizing increase exponentially. So 3 sounds good to me. Yes, the drain is such a pain!!!! Ouch big time. Also I hate taking all these pain Meds I feel so unstable. However all of this is nothing if I am cancer free and that’s what I keep reminding myself. Had the implant done at time of surgery and after I see the Plastic Surgeon tomorrow I will make my appt with the Breast surgeon and medical oncologist to find out what’s next. One day, one step at time we will all get through this!!!! Thank you for the information! It helps to know what to expect. I am having a bilateral mastectomy on January and I am starting to get nervous. I just want all this to be over with. Thank you for posting this great information. i’m having a bi-lateral mastectomy and reconstruction in about 4 weeks and had little idea of what to expect. This has been so helpful and gives me more courage to face the unknown. I’m glad you find the site helpful – that is why it is here! Remember to let others help you and take your time in recovery. Best wishes to you in your upcoming surgery and in the New Year. I’ve been seeing a doctor once a week since 10-17-13 getting mammo’s & biopsies. Was told I have DCIS and decided on 12-20 to have a left simple mast instead of a lumpectomy. My lump is 8cm plus the 2cm clear margins. I got my surgery date today for 2-3 and will have reconstruction with expanders done immediately after the surgery. I’ve had a really positive, upbeat attitude about the whole thing so far so I’m kind of expecting some sort of shock to set in after it’s been done. I really appreciate webpages like this and it makes me feel like I’m better prepared for what’s ahead. Thanks Britta! I had a bilateral mastectomy with reconstructive surgery (expanders) on April 15 so I’m two weeks post-op. My cancer was stage 1. The first few days were painful and tearful, but then I kind of “turned a corner.” My biggest gripes are that I’m tired and sore and the expanders feel tight. I had four drains which have never hurt at all, but they are awkward and bulky. Two were removed last week with no pain at all. I’m looking forward to having the other two removed in the next few days (fingers crossed). We all experience things differently and I’m glad your drains did not hurt. I’m also glad you found the corner to turn! Expansion can be uncomfortable so go slowly. You are so right about everyone having a different experience! It is certainly helpful to hear about other people’s experiences, but each person’s journey is definitely unique! I’m nervous about what’s to come but not NEARLY as nervous as I was before the surgery. It’s such a cliche, but you really do have to take it one day at a time. I see small improvements every day. This is a good site by the way. Came across this site when looking for at home tips post surgery. I just had a bilateral mastectomy for DCIS and only had one lymph node removed (clean) and was just curious how others recovered. I had 2 drains and 1 was already removed (4 days post surgery) and the other will be removed tomorrow (8 days post surgery) Cleaning the drains 5-6x per day helped flush things out as well as keeping hydrated. I am a very active person and was in the middle of training for an Ironman when I was diagnosed, so it’s been difficult to relax and not do anything. But I am definitely fatigued and do take advantage of naps, which I think have helped my recovery come along so well. I also have one of those pillows with the arms (Bed Bath & Beyond), which helps keep me propped up while sitting and/or sleeping. I also use a larger pillow in the side of me and am able to sleep on my side relatively comfortable. Another tip was putting bacitracin around the drain stitches to help with the pain. Also a friend of mine made me this awesome shirt with ribbon ties all down the front and inside pockets for my drains. This has been a complete lifesaver to me!!! Thank you so much for these tips. I will be undergoing a double mastectomy next month. I have also been diagnosed with DCIS Stage 0. It has been hard to grapple with and make the connection of how I can go from being diagnosed with PRE-Invasive Cancer but yet Mastectomy is the only treatment option but because of the large area. I have no choice. DCIS was only found on my right side but I have opted to go forward with a double mastectomy. I have saved your tips so again thank you! Bettie, I have heard that treating the swelling with ice may not be a good idea since you are probably numb from the surgery. The peas might work because they wouldn’t be as cold as an ice pack. It will be hard to tell though if it is TOO cold. Maybe just use a cold (not frozen) compress till you can speak to your doctor’s office. I was thinking about mastectomy recovery. This website looks helpful. Thanks for the information. I was diagnosed with DCIS in March 2014, and had a lumpectomy and removal of 3 lymph nodes in May. There were no clear borders so I had a left mastectomy on July 18. I am having a difficult time sleeping on my back and was looking for ideas. I use several pillows but find relief only when I sit up as the expander is very uncomfortable. I found some great suggestions from reading all the posts. Thanks everyone for sharing. Thank You to all for the helpful information. I was diagnosed with Stage One Invasive Lobular on 8/6 and am having bilateral mastectomy soon…should be finding out the date by the end of the week. I’m coping but am really scared as I was not thinking of mastectomy but after doing my research and getting many opinions, I feel that it is best! I found this site as I want to use this time to prepare for recovery. Super helpful comments…my best to you all! Thank you for your tips, I was diagnosed with IDC-L August 25, 2014 and will undergo a bilateral mastectomy October 30th with reconstruction I am very scared but deep down inside I know that I will be fine after my surgery. Hi Pattie I was wondering how your surgery went and how you are feeling now that it is behind you?I am going to be having a double Mastectomy next month and scared to death!! I’m glad I found this website with helpful hits.Please let me know how your recovery went. I was diagnosed with DCIS October 1st and had right total masectomy and 3 lymph nodes removed because my lumpectomy did not produce clear margins . I am 4 days post surgery and experiencing chest pain and expander very bulky and uncomfortable . Feels like it might poke through the skin!! I have one drain and that pain has greatly subsided and I am going to hopefully get it out tomorrow! This has been a great site and I have referred to it a lot ! My advice would be to get your entire house cleaned and all laundry done and buy cheap men’s flannel shirts ($7 from Walmart ) because they hide the bulky drain, are soft, and easy to put on. Also invest in paper plates so you don’t have to do dishes! Even loading dishes in dishwasher is exhausting 😦 . Thx for this site! Thank you for taking the time to help others. This post has great common sense information, thank you for giving women permission to plan for restored health by planning rest.I will share this with my sister who is having surgery January 9, 2015. I wonder why you had so much pain. I’m sorry to hear you had to suffer so much. Did you have reconstruction — possibly that would add to the discomfort. I declined reconstruction and have had almost no pain. The drains are a darned nuisance and they do hurt if I accidentally snag a finger in a loop, but certainly emptying the grenades and stripping the tubes are painless. Just stumbled across your site while googling the procedure involved in getting free of the hated drains, so have not yet had time to explore. But hope to read elsewhere that you recovered and by now are doing fine. Be well! Kerry. I hope things go smoother from here. I had a left mastectomy last week with immediate reconstruction and I’m so worried about infection. I know its a high risk procedure but I felt a little better starting the road to feeling like me again. I wish I had read all of these great tips before my surgery! Hello Britta – I found your very helpful site today – 18 months after breast cancer diagnosis – and have read every post. You are providing a wonderful way for people to share tips, ask questions and get encouragement. Your specific Top 10 Tips are straight forward and more helpful than anything the docs or various oncology specialists provided. My only regret is that I didn’t stumble upon your site before now. I am 8 months post mastectomy and going through a long reconstruction process, trying to tolerate the extremely uncomfortable tissue expander and now dealing with the added pain of an infection near the surgery site. Heavily medicated with antibiotics, and 3 more months until TE comes out and permanent implant goes in. At this point for me, while I wait-wait-wait for the final surgery, managing the continual discomfort is the name of the game. A properly-fitted bra (or no bra at all), the use of pillows (under arm, between chest and seatbelt, and while sleeping) and ibuprofen as needed are the things that are helping me get through this stage. Anyone have additional advice, particularly for TE discomfort? Anyone else feel like there is a boulder on your chest? Thanks, and best wishes to others out there struggling to get back to your “normal” self. Thank you so much for this info. I am having bilateral mastectomies prophylacticly after being cancer free for 8 years. I wanted the mastectomies when first diagnosed but was talked into. Lumpectomy. It has always bothered me. I had a TNBC and do fear recurrence. I am grateful to have support of doctor’s and family. Thanks for your tips–I am a retired Oncology RN and get the importance of all this. I’m just now in the process of absorbing my diagnosis of breast cancer. I have choices to make. Lumpectomy with radiation that scares the pants off me or double mastectomy with breast reconstruction. The thought of having reoccurring cancer and radiation treatments are giving me such anxieties. Then I see that the drains and expanders are driving people into despair. I know it’s a personal decision. Are you happy with your decision and does the pain go away. I heard radiation can cause so many issues and kill healthy tissue and cause nerve and bone damage. Everyone has a choice and I’m freaked out with both. Thank you so much for the information. It’s very useful for me. I will try to do all your recommendation. I live in Thailand, so far away from your home. I will under go my surgery tomorrow, mastectomy due to DCIS. I wish you healthy and enjoy your life. Hello to everyone! This is a very helpful, useful site to read posts with questions, answers and info in general. I had a left breast mastectomy because of High grade DCIS last Wednesday, 9/23. I also had 3 sentinel nodes removed and one drain put in. Tomorrow is my post-op appointment where I hope to find out all of the pathology results because wondering and waiting just drives me crazy!! I took the oxycodone for the first few days, even though I had little pain. Not knowing what to expect, I didn’t want to take any chances. But then I stopped a few days ago and have very little discomfort which is what I was told to expect and it was true! (I am 60 yrs old) I wish everyone dealing with breast cancer the best of everything – the best possible outcomes! Hello everyone. I had bilateral mastectomy 4 weeks ago today. I wish I had found this site before my surgery as it would have saved me some pain. I suffer from the nerve pain on my skin more than anything else . It hurts when my hair touches it. My Dr . Finally told me to rub my skin as that will help desensitize it immediately and will shorten the length of time I will suffer from it. It worked. My biggest tip! Make sure you have a small pillow to put under your arm! I carried mine everywhere for the first 2 weeks. Really worked and handy if you cough or to put between you and your seatbelt on all of those post surgery Dr. Visits. Good luck and God bless to you all. Thank you for your detailed information. I had my mastectomy (with lymph nodes) last month. I,m now recovering. I’m a working girl. I don’t know how much I have to rest. i want to go to the office and start my work. I’m doing the exercises regularly. Taking hormone daily. I’m doing the cooking myself. No problem for taking bath and dressing myself. Do I have to take more rest? I’m not worried about the mastectomy. But worried about the removal of lymph node removal. (mine was the 1st stage. nothing in the nodes). Can I resume my computer work? Can I go and shop? Can I travel by bus/public transport? I don’t have chemo/radiation. Now, I want to share this: Don’t be in a panic when you realise you have cancer. If you’re panic, your family will suffer more than you. Prepare for the worst. Do the checking of your breast (by self) every month. Do mammography once in 2 years atleast. This is nothing. If you’re diagnosed early, you are blessed. It’s your body. You have to take care of yourself. If something happened, you’re the only one to suffer physically, but mentally everybody around you. So, be ALERT!!! Once again thanking you for the tips. I had a double ‘simple’ mastectomy for DCIS after a failed lumpectomy. That was December 17, 2015. Now it’s the end of April and I am suffering horribly from fatigue and foggy in the head. I was lucky enough to avoid radiation and chemotherapy – even estrogen blockers. What can I do about the brain fog and the fatigue? I feel it’s unusual to be so affected. I am 56 and post menopausal. No longer allowed to take my bio identical hormone pellets….I had my two drainage tubes in me for six weeks so was housebound….anybody have a tip to help with the fog and fatigue? This is very helpful! Tired off dr.s saying gonna pinch or not hurt..thanks for being honest! I am looking at a mastectomy with reconstruction spacers in two weeks for DCIS, and am starting to get nervous about post op expectations. I have not gotten any real information on life at home and care of drains, and reading your blog has helped, but leaves me wondering what I need to buy or take to the hospital. I will be in on a 23 observation admit, so pretty quick turnaround. I have asked about the camisoles to hold the drain and was told I could just get a lanyard at the dollar store and pin the drain to that because it won’t be “that long”. My plastic surgeon said he took the drains out of one patient at 2 1/2 weeks, but that was really fast, and his normal time was more like one to two months. Yikes! Do I need to get a pillow purse? Do the wedge pillows really work? Thoughts on securing the drains? What to wear home from the hospital? This is the first time I have every participated in a blog, my daughter sent this to me, so I hope I am doing is right. Thank you. Camisole: I did not by a camisole, but there are some nice ones on the market now. I simply used a hardware $1.00 cheap hardware store bib that had two pouches and wore it outside my gown. The drain bulbs fit nicely there or you can pin them, but I preferred to hide those as they are not too attractive to others (or you) to look at for a couple of weeks. Do what feels right for you. I am a “do it yourselfer,” so that was my solution and I had it ready to go before I went to the hospital. Pillow purse: also up to you. I got one as a gift (though given to me really after I needed it) or just find a small soft pillow that is not an heirloom you can use (or two if double mastectomy) to place under your arm to relieve the pressure. It does help. Drains: Take my advice and take a pain med one hour prior to getting your drains out. Mine adhered to my skin and were very painful coming up. Some patients report they didn’t feel much of anything, so again you will have to see how you react to this. Just remember to empty them and take regular pain meds to keep the from doing a roller coaster of pain waves. Pain medicine is your friend, so use it on a schedule. Clothing: Do not bring any pullovers – just zip (preferred) old comfy clothing. I’d recommend a sweat top (zipped) or other very easy to put and loose piece of clothing. Buy yourself a couple of these comfy outfits for your recovery time. It is not the time for fashion! Also sweat pants for the bottom – you will have a hard time using the bathroom and DO NOT wear jeans or anything with buttons or zippers on your bottoms until you get your drains out and are feeling better. Thank you, Britta. I will get some comfy sweats and pocket apron from my hardware store. Great suggestions. Feeling better about things now. I will take your advice on pain meds and hopefully will be on the short side on having to keep the drains in. I m so glad you have created this site. So do I plan to rest, recover and relax during my first week after surgery or do I plan to walk around the block during my first week? Plan to relax and take a very short walk, each day going just a bit further. Start this in the hospital with supervision, using your IV as a prop to help you walk. Then take a friend with you as you walk outside or around the house as you build up your strength and stamina. Don’t rush it, just steps more each day. I’m a 39 year old male. I recently had a right mastectomy and nodes removed. Your story has definitely helped with a lot of practical issues I face. Thank you so much for this. I am such a wimp about pain and surgery to begun with and adding to that the emotional piece of losing breasts just amplifies the anxiety. This was very helpful.